One of my fondest hopes is for my children to grow up to be confident — in themselves, in their capabilities, and in their beliefs. As the founder of Kiwi Crate, I’m often asked about the inspiration behind the company. Much of the inspiration comes down to confidence. 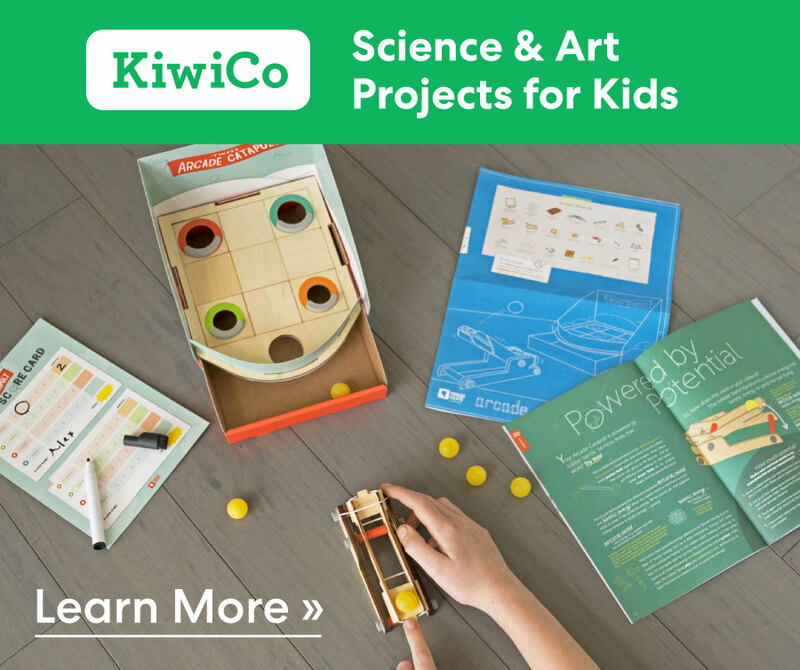 At Kiwi Crate, we intentionally design fun, enriching, hands-on activities that engage kids and help them build their creative confidence. We believe that this confidence helps kids think big and act like creators and producers instead of just consumers. Kids with creative confidence don’t assume one “right way” to build with LEGOs, paint a picture, or solve a problem. Their unique way is the right way! 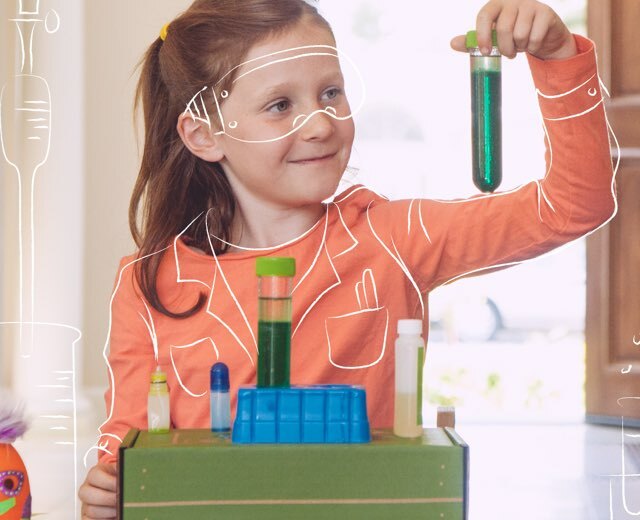 We celebrate tinkering, experimentation, and a diversity of outcomes. At the end of the day, our vision is to equip kids with the confidence and curiosity to tackle problems where there is no one right answer. The world is complex, and the jobs of the future aren’t necessarily the ones that we see right now. Cathy N. Davidson, co-director of the annual MacArthur Foundation Digital Media and Learning Competitions, notes that 65 percent of today’s grade-school kids may end up doing work that hasn’t been invented yet. We are going to need a lot of creative, confident problem-solvers to develop solutions that address the issues and opportunities of tomorrow. At home, my husband and I often think about how to foster an inner confidence and sense of self in our three children. We have a strong belief that this is critical to help them tackle challenges (at school, on the soccer field, at home, or in life!) with tenacity and persistence. We expect them to give their best selves, to engage deeply, and to make things happen. While this is definitely a work in progress, here are eight ideas that we’ve come to appreciate on our parenting journey. Figuring out how to encourage kids to be tough is tough. We want them to appreciate that things don’t always come easily, and that succeeding often takes hard work and lots of practice. Even when things get difficult, we expect them to put in the time, sweat, and energy to keep on. The grit and determination it takes to do your best and to try hard time and time again are associated with a deep sense of ownership, pride, and accomplishment. Confidence comes from toughing it out. As parents, we try to give our children enough space to try to tackle challenges on their own, while supporting them and providing a little coaching to help them along. 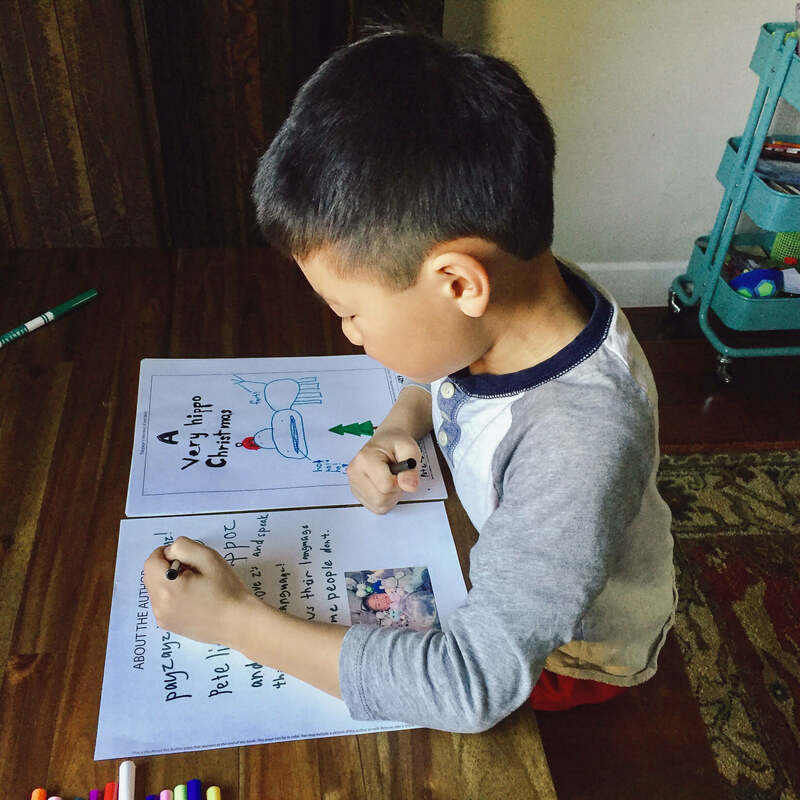 This was put to the test recently as our two grade-schoolers tackled an annual extracurricular project: writing and illustrating their own book. I have to admit, it hasn’t been easy to get them to come up with a unique idea, draft the story, write out every word in ink (neatly), and then draw and color the supporting illustrations. We’ve seen foot-dragging, crumpled and smudged pages, grumbling, and an overall reluctance to step out of their comfort zone to take on such a big, hairy project. I confess to nagging now and then, but we do our best to ensure the work is their very own. And at the end of it all, when their own hardcover book comes home, they experience a real sense of achievement. We’ve seen their pride in their work grow year after year, to the point that our oldest, now a fourth-grader, has both the confidence and the skills to write and illustrate books completely on her own. While it may be too much to ask kids to relish the hard work required to master or complete something, we hope that they don’t simply give up when the going gets tough. We want them to engage, not throw their hands up or take the easy way out. And, as tempting as it might be sometimes, we shouldn’t jump in and do the work ourselves. While it may solve the problem in the moment, we know that won’t teach them how to figure out problems on their own. When my daughter was just a year old or so, I remember reading about Stanford professor Carol Dweck’s work on the growth mindset, and the importance of appreciating the process, not just the product. That is, the journey and effort is just as important (if not more important) than the outcome. It’s taken a little time for me to internalize this, but I’ve come to appreciate how my words and actions can influence how my kids approach challenges. 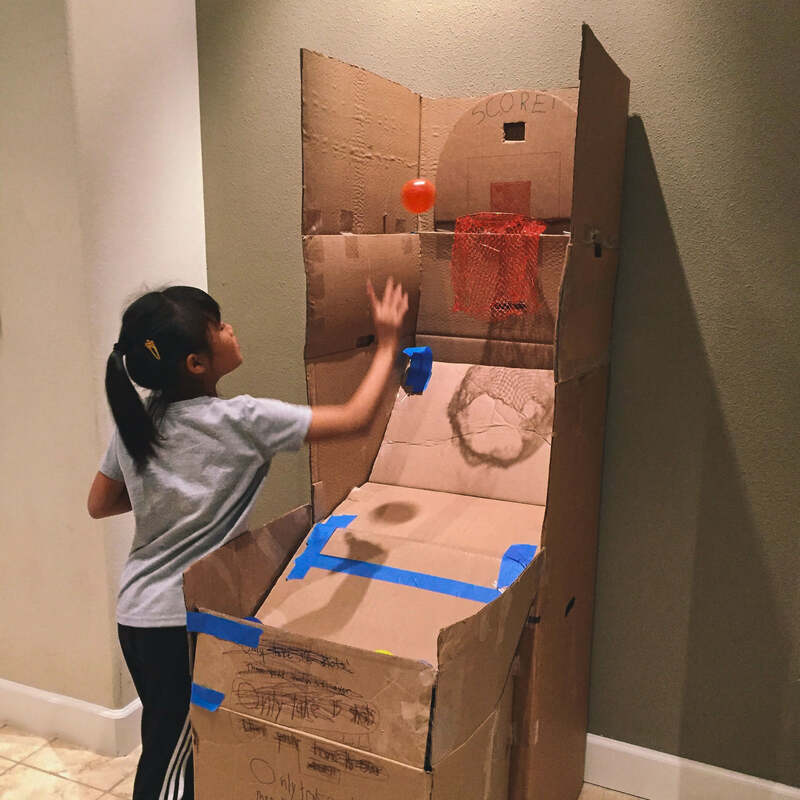 Last year, my daughter and her friend took part in a program where they were challenged to build a carnival game out of cardboard — with no instructions. For hours, they tested, iterated, and improved their design. It wasn’t easy to watch them struggle and make mistakes, but I managed to restrain my instinct to help and allowed them to solve their problems on their own. It was so rewarding to see the growth and learning happening right in front of me. I tried to emphasize just how impressed I was by their effort, with the hopes that it would bolster their confidence and encourage them to lean in, even when it’s hard. By having the freedom to make connections on their own, kids develop the confidence to explore and figure things out for themselves. 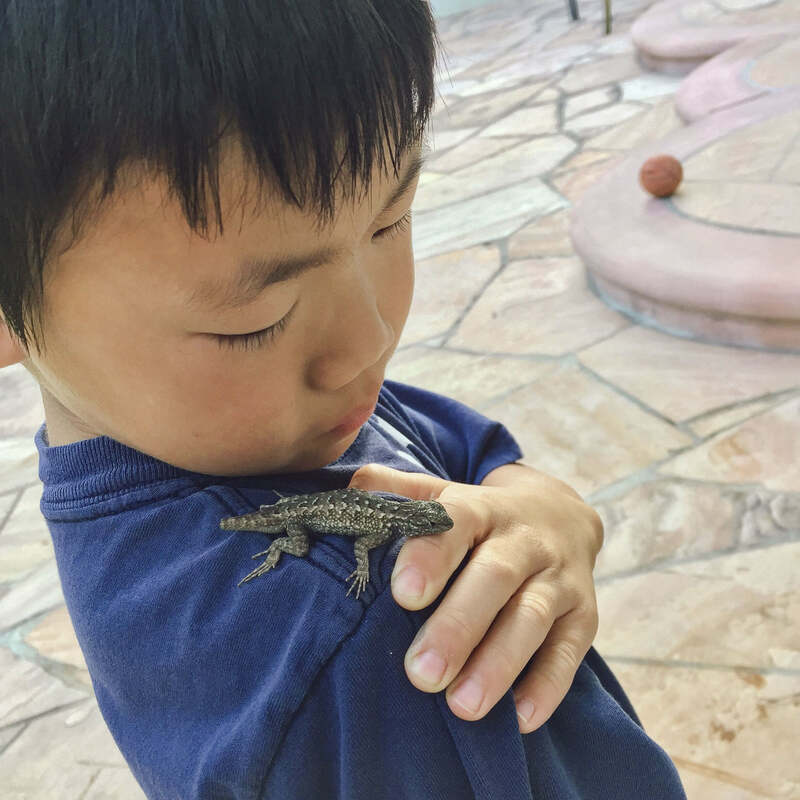 We try to help our kids explore their interests, from static electricity to backyard lizards, as long as they (and others — like the lizards!) aren’t getting hurt. We also want to allow our kids the freedom to explore and to tap into their imaginations to come up with their own ideas. This can result in some very entertaining family games, such as our second-grader’s recent combination of kickball, basketball, and dodgeball, and a fun game that our fourth-grader proposed on a long car trip: “Create names of places you’d never want to visit.” As you might imagine, answers like “Pooville” were met with peals of laughter. I’d love to do more with my kids to encourage them to find new ways to solve a problem. I believe that the practice of exploring their own creative ideas for solving problems and asserting their point of view will get them comfortable with acknowledging that there is often no one set way of doing things. It presents them with an opportunity to appreciate the possibilities. Also, I think it lays a foundation for innovation and the confidence to try new things and new approaches. We’ve found that it can be rewarding to work together as a family to solve a problem. On a hike last year, we tried to find different ways to cross a creek. 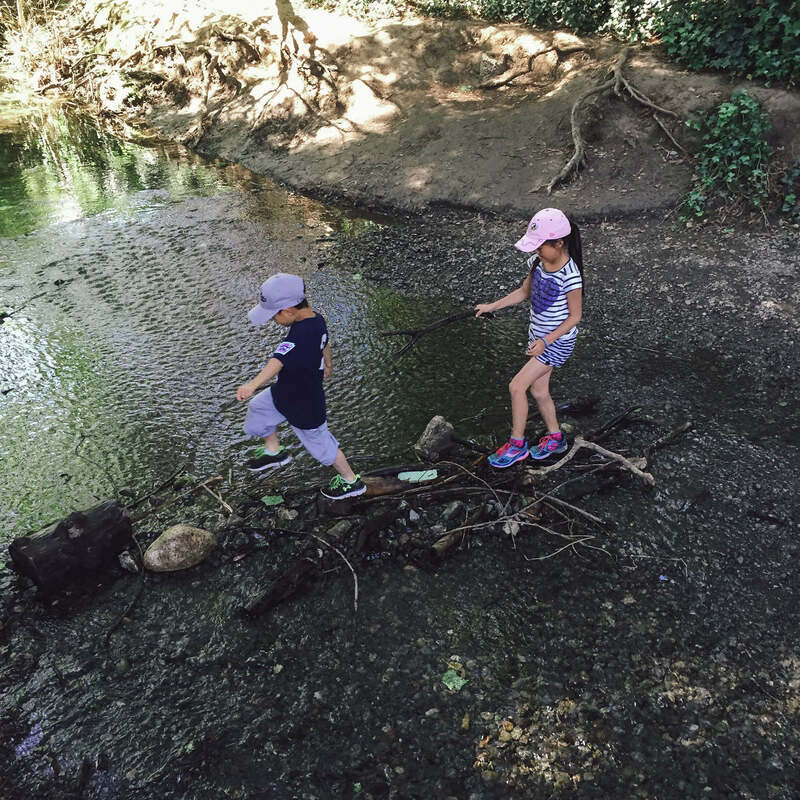 We built a bridge with rocks and sticks, and discovered that while some rocks worked well, others weren’t steady under our weight. We also looked for a strong, sturdy vine to act like Tarzan and swing across, and discussed how fun it would be if we could build a zipline to ride. (Unfortunately, the swing and zipline were ideas that we couldn’t quite put to the test.) Of course, there was the very wet approach of simply taking our shoes off and walking across too! Another way for kids to appreciate different approaches and paths is to have several kids tackle the same problem and see the diversity in the solutions. My oldest two were drawing self-portraits just the other day. From the medium (marker vs colored pencil) to the perspective (full body vs headshot), both their processes and their end results were completely different. My hope is that experiences like these will allow them to celebrate their own perspective, while giving them a new, fresh way of looking at things. #5 Take the pain out of failures. Sometimes we find our kids are hesitant to try something new or difficult. We remind them that no one starts off good at anything; to get there, you have to push through, even though you’ll falter here and there. In her off-season, my daughter plays indoor soccer. We are encouraging her to try new moves and experiment with her shots. We are basically giving her permission to fail! 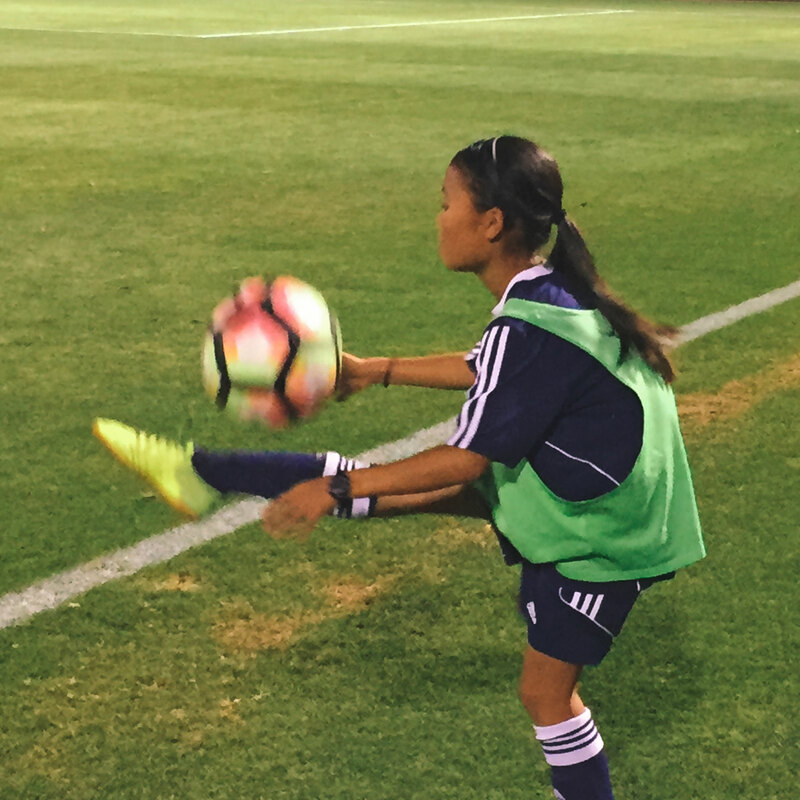 More experienced players know that developing your skills means trying something new and failing until you’re able to master it. As she’s started to take on defenders with her new tricky moves, it’s been a little hit or miss. But, for certain moves, she’s starting to see the practice pay off with tangible results, and we see her confidence in her skills grow. We want our kids to learn that they can master something and rise from failure on their own. At the end of the day, their confidence is tied to this independence. As they get older, we won’t always be there. So one of the things that we try to do is encourage our kids to speak for themselves and to make their own choices. Finding their own voice can be as simple as allowing them to order their own meals at restaurants. The other week, my first-grader was at the library. He was having some issues with the self-checkout, so he had to approach the librarian at the desk with his books and library card. As we walked up to the desk, the librarian turned to me and asked how she could help. I didn’t respond. Instead, I turned to my son. He had to pipe up, explain the issue, and get things resolved so he could take his books home. I’m glad he had to assert himself to solve a problem, and I hope that he continues to do so. Ultimately, I hope this translates into having kids who will stand up for themselves and for what they believe in with strength and conviction. #7 Set a good example. We all know that our children are watching us and modeling our behaviors — sometimes, a little too closely! (I swear it feels like we can’t get away with anything.) In any case, as parents, we have a responsibility to set a good example, even when it’s not easy or inconvenient, and this definitely includes having a growth mindset ourselves. Unfortunately, I’ve been caught not setting the best example. A couple of years ago, we discovered that everyone in the family could do a set of two or more pull-ups … except for me. I joked and said that I didn’t think we were ever going to get 100% participation because of me. My children were appalled. “You need to work hard, Mommy,” my then-5-year-old said. “If you try and practice, you can do it.” Gulp. They basically spun my own words for them back on me. So, I’ve been on a quest to be able to do more pull-ups, because they’re right. I should be able to do it with some hard work and effort. They called me out on not setting a good example, so that’s even more motivation! As a final note, spending time with our kids and exploring the world together helps bolster their confidence. As the CEO of a start-up and mom to three kids, I am often distracted and pulled in many directions. Yet, I know that carving out the time to feed their curiosity, to play, and to explore together demonstrates to my kids that they are worth my time and attention. So I try my best, because that time together enforces that I think they are important and feeds their confidence. 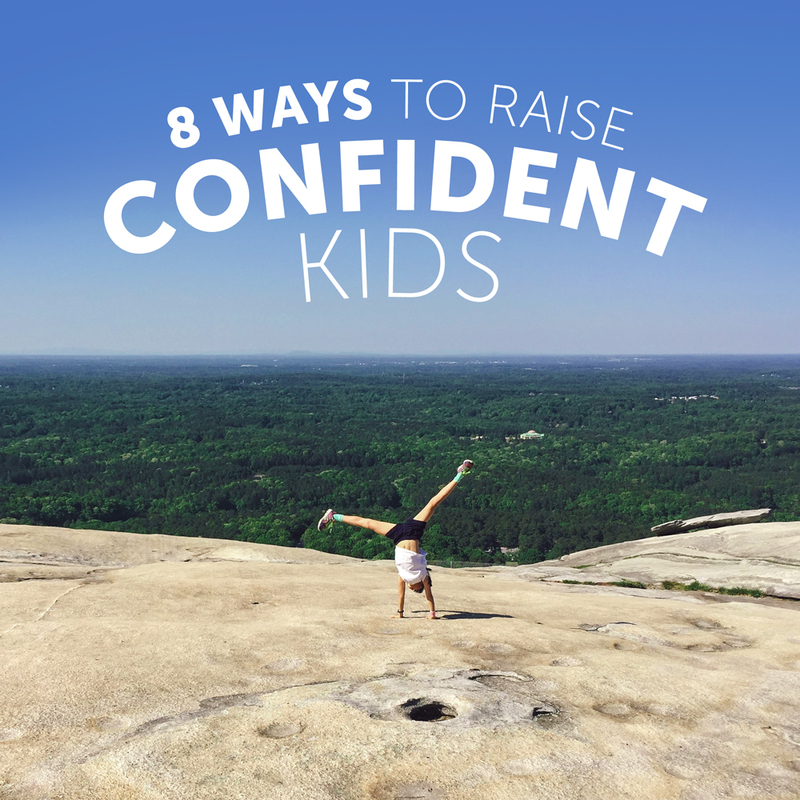 As you spend time with your children and help them cultivate their confidence, I’d love to learn your tips!